Hancock Refrigeration offers residential and commercial sales, service and installation of all your heating and air conditioning needs. 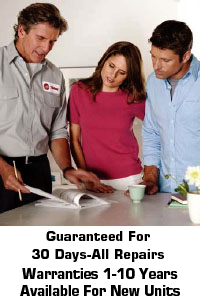 We specialize in heat pumps, central air conditioning, and more. With 41 years in business, we provide the knowledge and experience to keep your home comfortable. Before the cooling or heating seasons, it is a good idea to have your system checked out by one of our maintenance experts. Small problems can become bigger problems as your system continues to run. Just as your automobile needs regular maintenance, so does your air conditioning system. You should clean or replace your air filters each month. Should you require service on your current home comfort system, our skilled technicians have the know-how to diagnose, adjust, or repair your system so that you are comfortable all year long. For safety and warranty reasons you should never attempt to service your unit yourself. Call Mark or Brad of Hancock Refrigeration today at 301-475-8298 or 800-863-1259, or browse our website for more information regarding our commercial refrigeration services or to view our testimonials. If you have any other questions or comments, please e-mail us.